And shock, horror, I ran out of them! That just meant I needed to get a quick batch of Pickled Onions done to tide her over. There is no sugar in these recipes but there is a lot of peppery vinegary bite. 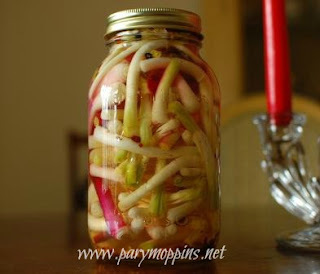 If you like frou-frou lightly pickled pickles then these are probably not for you. Consider yourself warned that we like punchy pickles. They are one of the easiest pickles to make. They are so easy in fact, that I will give you several ways to make them. Starting with the brine. You can use these brining methods with all sorts of vegetables. It draws out the excess water in the vegetable and makes for a crunchier pickle. Keep a ratio of scant 2c. salt to gallon water. Put clean onions in the brine and cover with a tea towel. Leave overnight. Rinse well before packing into jars. Pour salt over clean vegetables in a glass pan and cover with a tea towel. Leave overnight. Rinse well before packing into jars. Maintain the ratio for as much as you need. I often make extra brine and will throw in all sorts of vegetables and leave them in the fridge to pickle themselves. Pack your brined onions into the jars. In a saucepan combine pickling spice, salt, and vinegar and bring to a boil. Boil for 15 minutes. Pour over the onions. You want the spiced vinegar to reach most of the way up the jar. Top up with water until you have 1/2" headspace. Seal with sterilized lid and ring. Finger tighten. Put one garlic clove in the bottom of each jar. Pack your brined onions into the jars. In a saucepan combine spices and vinegar and bring to a boil. Boil for 15 minutes. Pack the onions in the jar. Pour over the hot spiced vinegar. Top up with water. Put a lid on the jar. Let cool on the countertop. Then put in the fridge for at least a week. Done. Fabulous! Let me know if y'all liked them. Thanks for stopping by Ms. Cassidy! This looks like a great idea and delicious Pickled Onions. I will be trying this recipe. Your recipe is awesome and thank you so much for sharing it with Full Plate Thursday. Thanks for stopping by Miz Helen. And your pickle pot pickles are AWESOME!! !